It's the morning of Friday August 3, and I've arrived 30 minutes before dagogo's third annual California Audio Show begins in Burlingame's Crowne Plaza Hotel. 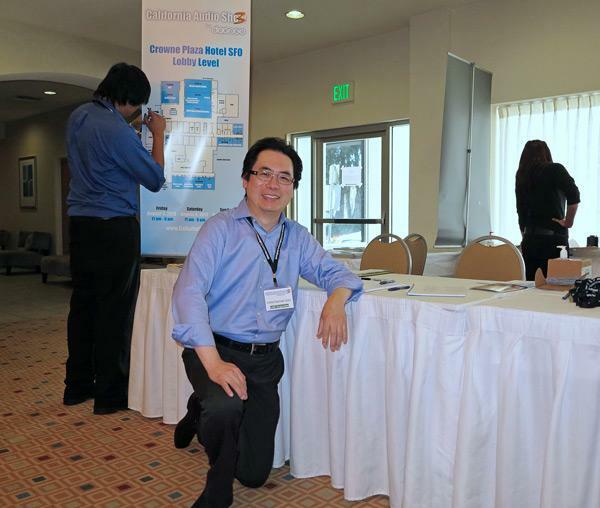 In the lobby, the website's founder and show organizer, Constantine Soo, just has time to pose before a map of exhibit rooms on the hotel's first floor. A glance at the 42-page show guide here shown being perused by my daughter Daisy Mae Dovenreveals 17 exhibit spaces on the first floor (including The Cable Company's very active hallway exhibit), 9 on the second floor, and 10 on the third. Yes, 36 total, just as promised. This should be a very nice show. First, order of business: deliveries. A few weeks back, I was given a box of open-reel tapes that I thought might work for deHavilland Audio's open-reel/tape preamp demo. 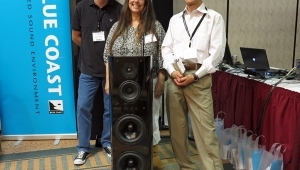 Hence the joy of encountering Kara Chaffee of deHavilland in the room her company was sharing with Randy Bankert's Sonist loudspeakers. When Marc Silver of Soundscape AV in Santa Rosa told me a few weeks back that he would be sleeping on the floor of his exhibit room at night, the Jewish mother in me offered to bring him my inflatable camping mat. In the process of delivering said pad, I discovered that the hotel wasn't exactly ready. At 10 minutes to show time, furniture still litters the third floor hallways in both directions. At T.H.E. 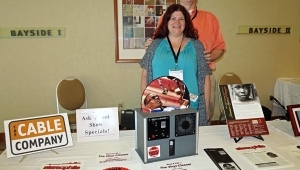 Show Newport Beach in June, Bob Levi, show co-organizer and President of the Los Angeles Orange County Audio Society, was waxing ecstatic about Jack Bybee's new Bybee Gold Goddess 'Super Effect" Phono/Interconnect RCA Bullets ($2195/pair). Happening upon Jack in the hallway, we shared coffee and herbal tea in the hotel restaurant as he told me that while the bullets were initially designed to counter what he calls "very low-level quantum noises" that obscure low-level details between turntable and phono preamp, he has discovered that they work equally well between other components, including digital. Jack explains that his internal speaker bullets are now used in speakers from Boenicke Audio (which he says won a Best Sound of Show in Munich) and Marten Audio. Jorma Design and WyWires incorporate his products in their speaker cables. In addition, many of his devices are now available for DIY and OEM use from Parts Connection and, in the UK, Audiocom. At 82, Jack is finally moving close to retirement. 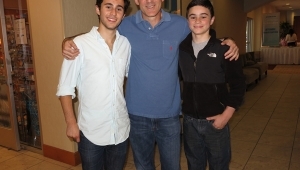 Hence, he plans to hand over management of his new Bybee Technologies website to his nephew, Marc Stanbuck. Meanwhile, his Music Rails are now distributed by Bybee Labs, which is run by Scott Frankland and Doug Hall. Final stop entails delivering a big bag of organic almonds to the BAAS (Bay Area Audiophile Society) Hospitality Suite. There I discover, in the throes of set-up, BAAS President Bob Walters and his extremely able partner in crime, daughter Caitlin Carney. Bob isn't smiling because I've just told him that he needs to straighten up the signs touting the room's bargain sound system. Adding to the excitement of the show for me was the many years I have loved basic electronics. I have never seen the many hi-end companies face to face. I didn't know that the main characteristic of the goods that would astonish me was the immense size. Cable were 2inches thick and preamps were 17 inches square. Which i new from specs but look much more aggressive than basic electronics. Coming in from Vegas, it was a sync to find the hotel. though the GPS died as I ventured to Ikes place afterward, but I digress. As I entered the first floor the main desk greeted me and gave me my namecard on a string; a nicetouch. It really made you feel like an invited guest. The first peice of hiend gear I seen was VAC amps, they were beautiful, clear and luminated nicely for even a well lighted room. Soon my wife insisted I continue from this room to be sure I see everything. The MBL on the first floor didn't floor me like I assumed it would, maybe it was the low volume; 2nd best on the second floor was surprisinly Sony speakers. The show included used CD and vinyl to search through. Overall it was well worth the drive, gas, etc.Raysonic, Micromega and the Cary rm was where I spent most of my time. I will never forget it and hope to attend next year. Thanks so much for your comment. As someone who attends and reports from a lot of shows per year, it is always wonderful to feel the excitement of a first-timer let loose in the candy shoppe, as it were. As I plug away writing more blogs, reading your comment is like an infusion of fresh blood. Thank you again. 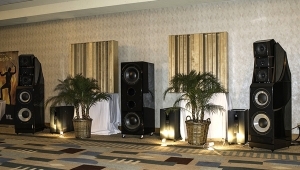 My first ever audiophile show. This show struck me as being quite small, with only 4 systems that were awesome. My favorite system was the MBL reference system, which I have been dying to hear. That is actually the main reason I went to the show. This system was totally awesome, but only with very high quality source material. 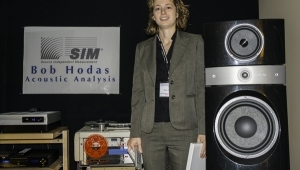 Average source material resulted in average sound, even with this system. My second favorite system was the YG Acoustic Anat III system, with Loggie Audio, on the second floor. This system, driven by Ypsilon amps, sounded great no matter the source material, even with an average CD the sound was excellent. Much more forgiving than the MBL system. The last system I was extremely impressed with was the Ayon/LumenWhite system on the ground floor. Great tube amps (Triton), great speakers. Overall a very nice show, just not big enough, too many companies not represented. I've had the pleasure of meeting Constantine Soo and can't think of a better Hi Fi embassador. The guy is a charm. Kara Chaffee makes the gear I someday aspire to own. Randy, too. The Sonist line is killer...and killer value. I am filled with jealousy at missing the show. Thanks for the report to soothe my pain. CAS3: Can It Get Better? CAS 3: On With The Show!